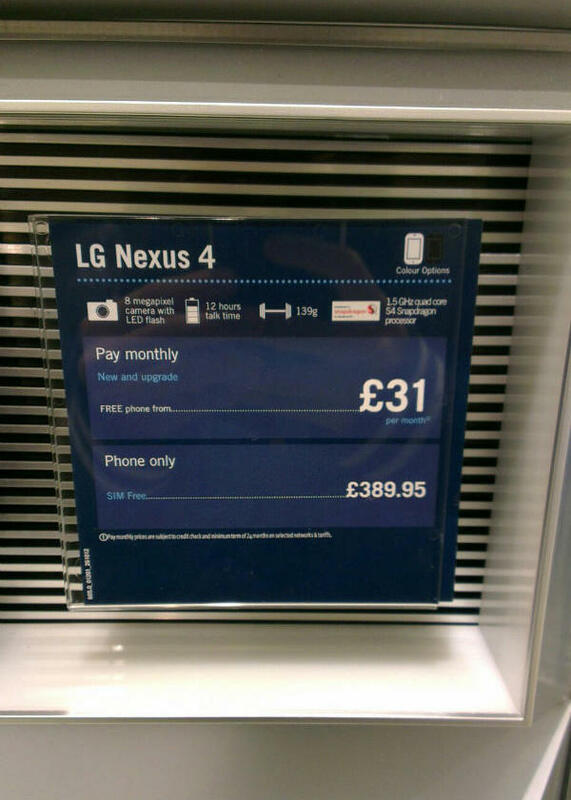 U.K. retailer Carphone Warehouse has jumped the gun again and placed promotional signs around some of its retail locations for the LG Nexus 4. 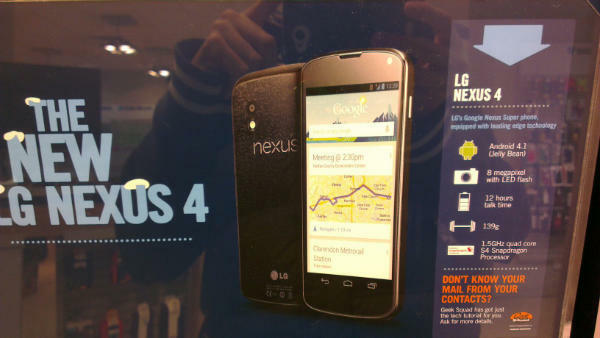 The LG Nexus 4 was due to be announced tomorrow at an event in New York City, but the event has been cancelled due to the arrival of Hurricane Sandy. Despite not yet being officially announced, leaks have been happening all over the Internet showing off the next entry in the Nexus series. One of the largest slip ups came last week when Carphone Warehouse put the LG Nexus 4 on its website, and removed it a few hours later. While you would think the retailer learned from that incident, it appears that word has not spread down to all of the retail stores. A user on XDA-Developers took some pictures of signage up in a Craphone Warehouse retail location. The images show us that the phone will be running on a 1.5GHz quad-core Snapdragon S4 processor, feature a 8 megapixel camera on the rear and is rated at 12 hours of talk time. The most intriguing bit of info, however, is it is listed as running Android 4.1, and not 4.2 as many sources have said it would. A second sign also let us know the phone will be free on contract with a £31 (Approx. $49.90 USD) monthly subscription, or £389.95 (Approx. $627.70 USD) off contract. With the cancellation of the announcement event tomorrow, there’s no word as of yet as to whether or not the phone will still release this week as many had suspected it would be.